For those looking to acquire this set to transmog for their warrior be prepared for a random process that might go rapidly or might drag for a while. Each piece of the actual item set (the non-boss drops) is created as part of a quest chain. The quest chains require random drops to be completed, specifically various idols (IE Idole du soleil for the helm) that are currently low drop rate. The idols may also be looted from various chests that spawn throughout AQ40 but as of this writing the chests require a key which is not currently available in game and the chests may not be picked or blasted open. This set uses the purple (officially "Blue") variant of the "AhnQiraj A1 Plate" artwork and forms a complete eight-piece set of the art. It constitutes the AQ set for Warriors. Note that both sets share the same bracers (Garde-poignets de profanateur de ruche), as there's only one file for bracers in the artwork database. This is probably intentional, as the bracers match the brown colour of the pants, gloves and boots, which is identical between the two sets. To get this, you must run AQ 40 a minimum of two times. It isn't soloable even in the best tanking gear, so bring more people; specifically, Death Knights will be your best friends as they are the only class that doesn't need to roll on your quest items. The Chest, Helm, Legs, Boots and Shoulders are pretty much guaranteed after a few runs. What isn't are the gloves Gantelets d'annihilation and cape Cape de clarté from C'Thun, as well as the belt Ceinture royale qiraji from Empereur Vek’lor. The bracers you can't see, but congrats if you get them. I've been digging around for some 2-handers to match this set and these are the ones that I have found. If you're not using Vengeance de Kalimdor or Sombre tranchante de la démence you are doing something very wrong with this set. Cuirasse d'annihilation is the same model and color as the breastplate if you so happen to obtain it before grinding to honored. Was clearing TK and got Ceinturon du chemin vertueux, it's an almost perfect match for this set. Have had horrible luck with the gloves/belt from AQ, at least there's an alternative for the belt. 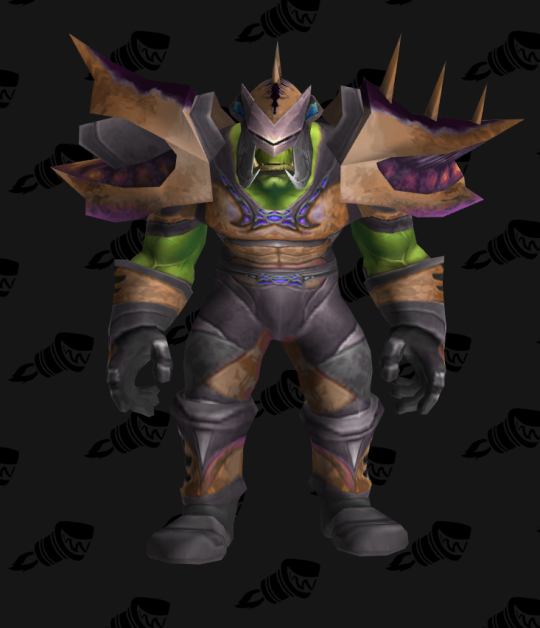 Conqueror's Battlegear is the Warrior Tier 2.5 Set which is obtainable via drops from the Level 60 raid instance Temple of Ahn'Qiraj, as well as quests related to the same instance. I find that for transmog purposes Grande tenue fluide d'Emdéhère matches this set pretty well. Suitably garish. Shame there's not an extra recoloured set (like in a dungeon or just non-tier set) for death knights, maybe in a Dead Mire-matching brown or something like this. Truly a shame that the later-released classes miss out on the weirdness of the AQ40 sets. You'll need reputation at Progéniture de Nozdormu (but just til honored) and items to turn in the following quests, so kill every mob you meet. Keep items like Insigne de seigneur qiraji, Scarabée en bronze, Idole de la mort and boss drops like Diadème de Vek'lor. Defeat the first boss, enter the temple and take the way on your left. There are Andorgos, Vethsera and Kandrostrasz waiting for you. Speak to Kandrostrasz, accept and turn in Champions mortels. You'll need reputation and the random drops mentioned above to finish these quests. Sometimes you may find Grand coffre de scarabéess which can contain some of these quest items. You need Clé de coffre de scarabées supérieur to open them. Take care of your bag space. Kandrostrasz offers the repeatable quest Champions mortels. Wait to turn in your Insigne de seigneur qirajis until you are 2999/3000 Neutral by killing trash and bosses. After that, gaining reputation becomes harder (no more trash rep).